Under each key in the upper keyboard of the V303J Continental II organ is a mechanism with five gold plated key contact wires that act as switches to complete the circuit between the tone generators and the drawbars when the key is played. Figure 1, at left, shows a diagram of the key contacts when the key is at rest, or not depressed. 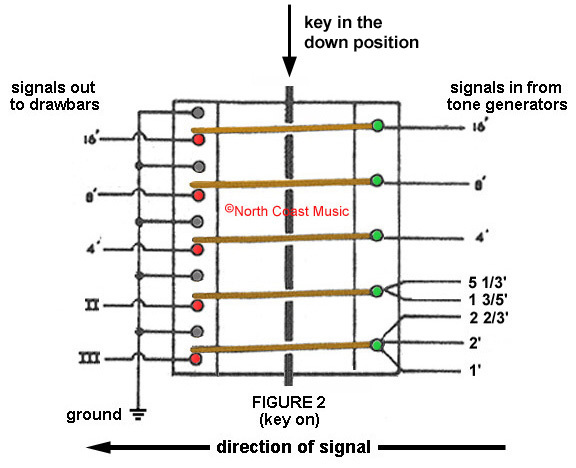 Eight individual signals from the tone generators enter from the right side of the diagram (through the green dots). The 16', 8', and 4' key contacts have one signal each. The II Rank contact has two signals, the III Rank has three. These signals flow through five gold plated wire key contacts. These key contacts pass through a mechanical "contact ram" (the vertical black line in the center of the illustration). Note that the left side of each of the five key contacts is resting against the gray contact, which reprsents the "ground" buss bar. This essentially shorts the signal from the tone generator. In this position, the key is turned off. Figure 2 shows the result of depressing the key. The "contact ram" has been pushed downward by the depressed key. The five key contacts have now dropped away from the grounded position and now complete the circuit to the five red contacts, which represent the signal or "hot" buss bar. This action has the connected the output of the tone generators to the 16', 8', 4' II and III Rank signals to the upper keyboard drawbar circuitry described in the next web page. The key is "on" in this position. 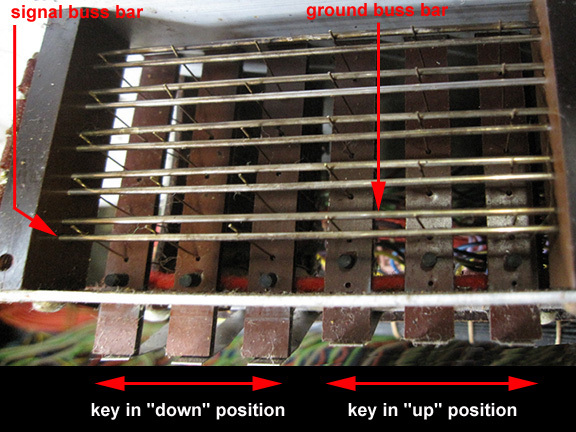 As you see, there are five individual key contact wires under each of the 49 keys in the upper manual of the Continental II Organ, for a total of 245. When combined with 196 key contact wires in the lower keyboard, there are 441 gold plated key contact wires in the organ. The lower manual of the Continental II is identical to the key contact system found on the V301J, V301E, and V301H single Continental organs. Figure 3, at left, shows a diagram of the key contacts when the key is at rest, or not depressed. 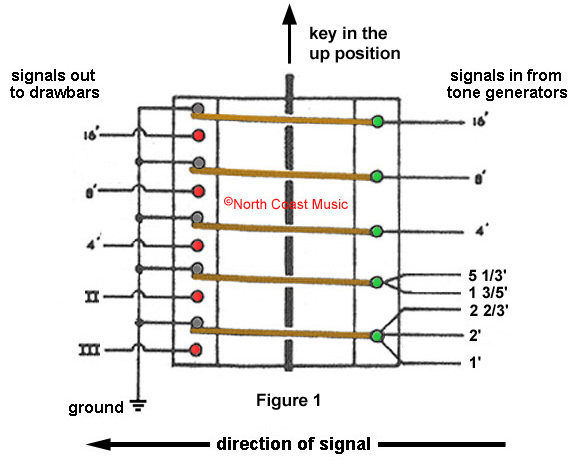 Seven individual signals from the tone generators enter from the right side of the diagram (through the green dots). The 16', 8', and 4' key contacts have one signal each. The IV Rank contact has four. These signals flow through five gold plated wire key contacts. These key contacts pass through a mechanical "contact ram" (the vertical black line in the center of the illustration). Note that the left side of each of the four key contacts is resting against the gray contact, which represents the ground buss bar. This essentially shorts the signal from the tone generator. In this position, the key is turned off. Figure 4 shows the result of depressing the key. The "contact ram" has been pushed downward by the depressed key. The four key contacts have now dropped away from the grounded position and now complete the circuit to the four red contacts, representing the signal or "hot" buss bar. This action has the connected the output of the tone generators to the 16', 8', 4' and IV rank signals to the drawbar circuitry for the lower keyboard, described in the next web page. The key is "on" in this position.